Keep Friday Oct. 21, 2016 open on your calendar because that is the date of the annual one night poker event “Lads Night In,” a joint venture by PokerStars and the charity Prostate Cancer UK. Prostate cancer claims the lives of 10,900 men every year in the United Kingdom, which equated to one man every hour and is expected to rise to 14,500 men in the next 10 years. It is the most common cancer in men with 330,000 living with the disease and is set to become the most commonly diagnosed cancer in the UK by the year 2030. The charity Prostate Cancer UK raises money in the hope to fund groundbreaking research, drive improvements in treatment and fight injustice in care. Now they have set an ambitious target of making prostate cancer a disease the next generation of men need not fear by stopping it from being a killer. This is where you and PokerStars come into the equation. “Lads Night In” was a massive success last year. More than 5,400 men and women took part in the at-home events and helped to raise £114,000 for Prostate Cancer UK. This year, with your help, the amount raised for charity could be even more. 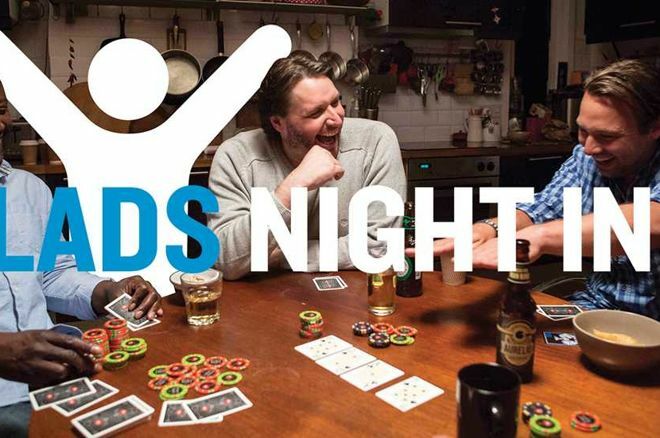 Special “Lads Night In” packs are available from the Prostate Cancer UK website and include a deck of playing cards, a dealer button and a sheet depicting the rules of poker in case you have some newcomers in your game. Players are encouraged to make a donation, no matter how small, and help raise money through playing poker with friends and family at home. James Beeby, Prostate Cancer UKJ's director of fundraising, said that they are proud to be partnering with PokerStars for its second year and excited to see it reach a wider audience. Click this link for more information about “Lads Night In” and to sign-up for your special pack. Although not directly prostate cancer related, PokerStars players can spend StarsCoins on charitable donations via the VIP Store. Currently, it is possible to make a $20 donation to Cancer Research UK, a $20 donation to CARE International or a $20 donation to Right To Play for 2,000 StarsCoin. A PokerNews Debate: Should The Hall of Fame Induct Chris Moneymaker?